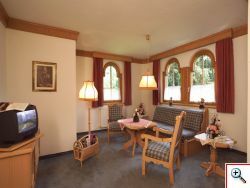 Our cosy apartments are furnished with lightly-coloured "Voglauer" furniture in Salzburg provincial style. 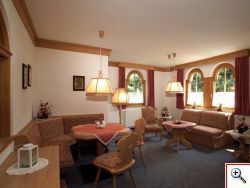 The apartments comprise a bedroom, living room/bedroom, bathroom, kitchen that is connected to the living room by a round arch, and a large sunny terrace with superb views of the Hochkönig. A safe is also provided. 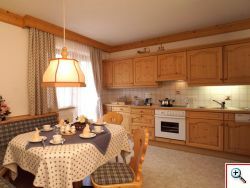 All holiday apartments in the Lärchenhof have a suitably equipped kitchen with a cosy dining area. Supermarkets and shops are also close at hand. If you fancy dining out, you can choose from several pubs and restaurants nearby serving typical Salzburg specialities and excellent food. We offer guests a bread roll service upon request – with bread specialities from the region for a great breakfast.